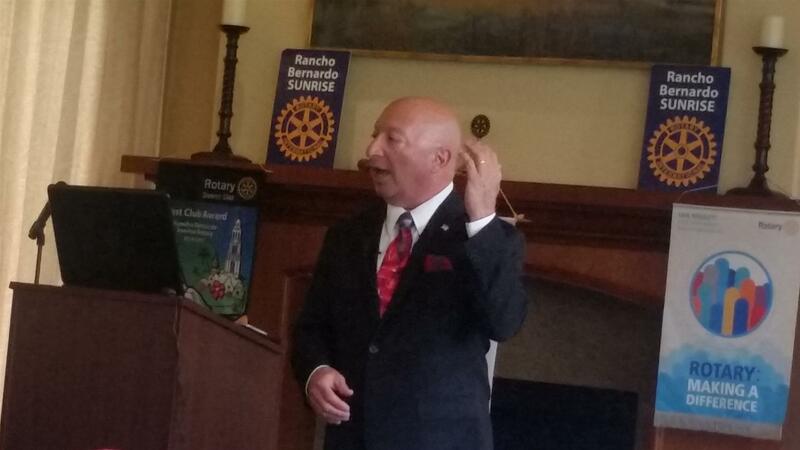 This morning members of the Rancho Bernardo Sunrise Rotary met David Alemian, noted author and regional expert on our nation's shortage of highly-skilled talent. David educated us about the coming shortage of doctors (90,000) and nurses (500,000) over the next few years, how the overall talent shortage endangers our economy, and how employers can protect themselves (it's complicated, but basically comes down to a return to the pension system and forcing employees to stick around for a few years in order to become vested). David has spent over 23 years in the life insurance industry and will be happy to walk through the details with you, or to arrange to speak at your organization, if you contact him at www.davidalemian.com. For more about the amazing speakers we have each week at RB Sunrise Rotary, stop by www.rbsunrise.org. Better yet, plan to join us here at the RB Sunrise Rotary Club. We meet almost every Tuesday at 7am at the Rancho Bernardo Country Club, Greens East Road in San Diego. Almost? Yes, we're closed on July 3 because of the holiday. See you on the 10th!